The Time is NOW to Innovate! I would like to thank George Couros, author of The Innovator’s Mindset, for inspiring me to foster my own mindset. He is an innovative educator with a passion for sharing, collaborating, and learning alongside others. His book is a game changer, and for me…a life changer. It has changed the way I view school, helping me realize that what I want for kids is possible and attainable. George and his words have motivated me to jump way outside of comfort zone and into a world of endless possibilties. I am grateful for his leadership and transparency. The reflection below is just that—a transparent display of my learning, thinking, and attempt to organize my thoughts in order to move forward with my school family. Thank you for reflecting along with me! I know what you are thinking! This is a HUGE question. It has a very simple answer…NO…a “shout it from the rooftop” kind of NO! The irony in this simplistic answer is considering what must happen after we shout from the rooftop. I have spent months reflecting and pondering on the idea of an innovative school culture, in fact, I haven’t written a blog post since July! It was not until I began reading The Innovator’s Mindset by George Couros that my thoughts began to organize, and my vision began to form. I realized quickly that I was overthinking the entire concpet of innovation. I was creating barriers such as resources, budget, professional learning, etc., that were driving a wedge between my current reality and what COULD be. Innovation doesn’t require a complete reconstruction of everything we have in place. In his book, George Couros refers to innovation not being about the stuff, but instead a way of thinking (p.35 #InnovatorsMindset). When I read this statement, it served as an awakening of sorts. I began to see my mind shifting away from the barriers and toward the possibilities! An innovative culture cannot happen overnight, but there is no excuse to wait on beginning to think through the filter an innovator’s mindset. Kids need us to keep our minds open to new possibilities and methods. We owe it to our kids to create conditions where they can explore, discover, create, fail, and LEARN in the process. Kids can do these things, and WILL! School leaders must provide their teachers, families, and community the same conditions. Adults can do these things and WILL! We simply have to open our minds to the possibilities. So…where to begin? This has been my question for months now. Global thinkers such as myself often think so big that they find it impossible to get started. I have determined my starting place, and it’s quite simple. I share with everyone as a learner–as someone who needs to hear from others regarding school culture. As you read my thoughts, please consider commenting with yours. Together we are better. I could add to this list because there is so much to consider and learn, but decided to focus on a few questions to guide my thinking, learning, and leading through the process of shifting to an innovative culture. As Michael Fullan says, “Change is a process, not an event.” Narrowing my focus will support the process, and guiding questions will support my conversations will all shareholders connected to our school. After all, doesn’t the best learning happen when we refrain from telling and instead ask questions? The above quote resonates with me daily as I begin the process of cultivating an innovative culture for kids and teachers. Yes, it is uncommon, but do the people invovlved not deserve more than ‘common’? 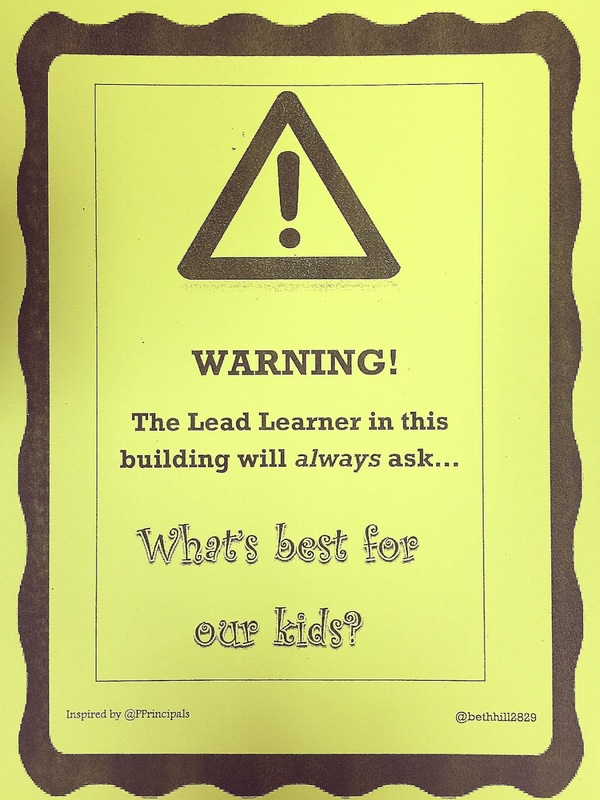 I shout from the rooftop, “YES!” Our teachers deserve lead learners who empower them by giving them autonomy with their planning and schedules. They deserve conditions suitable for them to facilitate their own learning, to explore, to collaborate, to dream, to fail, to perservere. Our kids deserve teachers who can model the traits of a life long learner so they too will have the same learning conditions. If a learning community commits to viewing school this way, a reciprocity of teaching and learning for ALL…well let’s just say I get chill bumps when I imagine it. The flipside to this is allowing the horrible Ttwwadi Monster to lurk in our school, waiting for the optimal moment to show his ugly face and squelch our ability to think differently. He’s always there…waiting on us to have a weak moment and revert to what is comfortable. When we leave our comfort zones and begin to try something new, we take away his power to infest the culture and attempt to keep it from moving forward. 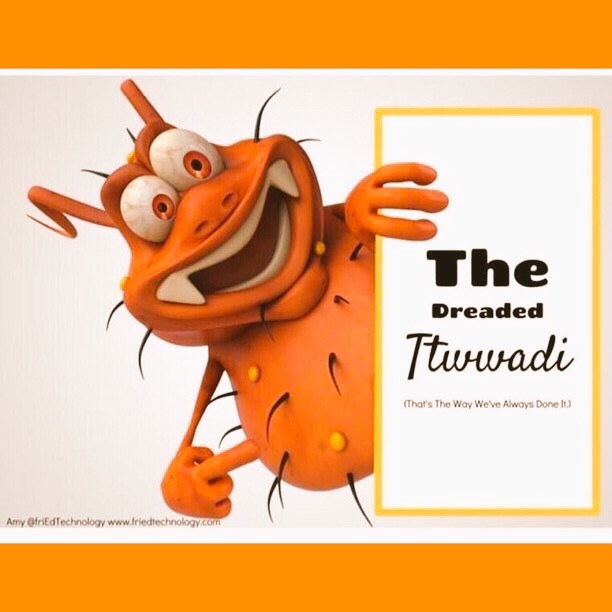 When a school community comes together and decides that an innovator’s mindset is necessary in order for our kids to have the learning environment they deserve, the culture will begin to grow, and become a place where the Ttwwadi Monster can no longer lurk. 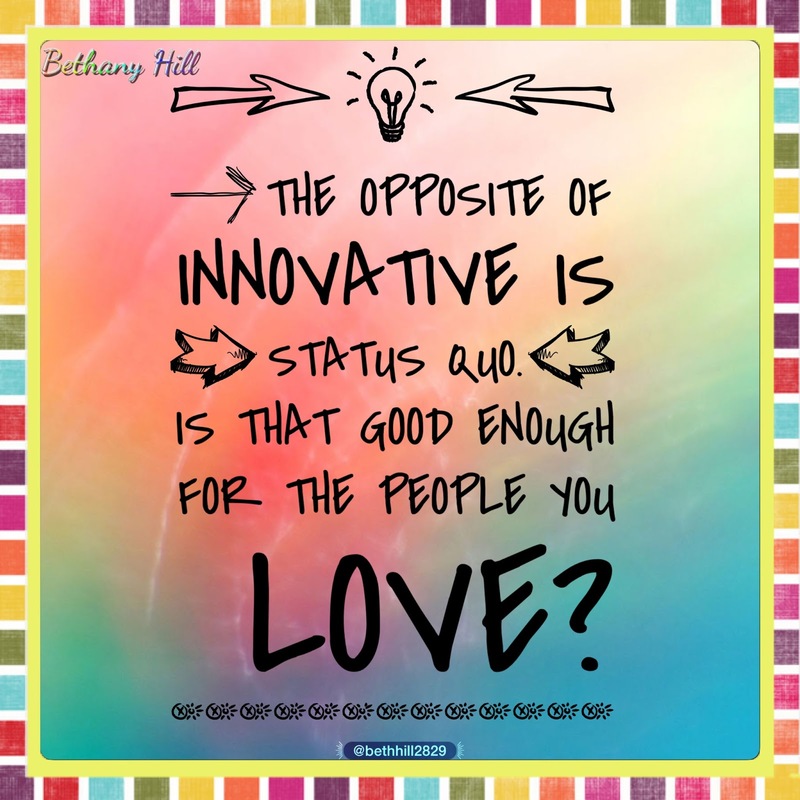 Cultivating a culture of innovation begins (for me) with questioning the status quo as a collective group. It begins with looking at adult learning differently in order for adults to support kids’ need to learn differently. We will all feel some cognitive dissoance. We will all feel a level of discomfort. We will all grapple with our own practice and wonder if it’s enough for ALL kids. I believe the struggle is REAL (trendy phrase), but well worth the experience. 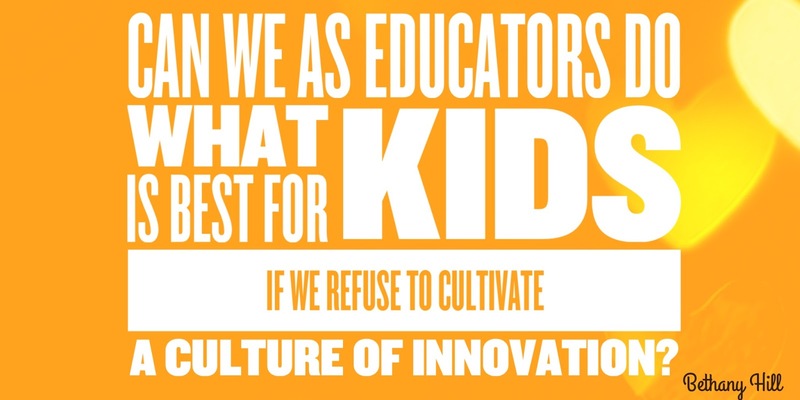 I plan to get comfortable being uncomfortable, and admit that my school culture needs to be cultivated. The people within my school need to be empowered. Passions need to be discovered. Talents need to be tapped into. Lives need to changed for the better. Learners and teachers need to reverse roles depending on the situations we find ourselves in. Learning needs to be evident in adults by the way they network with one another, and through their connections in a Professional Learning Network (PLN). We all want our teachers to BE this for kids, so we as lead learners must BE this for teachers. Teachers are responsible for their learning, but lead learners/administrators/principals are responsible for creating conditions where this can happen naturally. A culture of learning will feed a culture of innovation, and in time, become a marriage bound by the people who were part of building it. The time is NOW. Let’s do this. 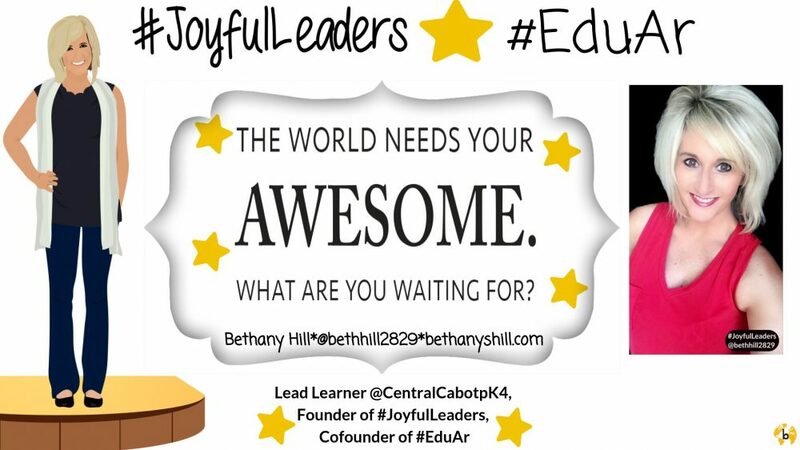 This entry was posted in Edcucation, Innovation, Leadership, professional learning, School Administration and tagged Education, Innovation, Leadership, Professional Learning, School Administrators. Bookmark the permalink.